The golden hour to cultivate diversity is in preschoolers! Even in our modern-era, racial and cultural biases are still prevalent which makes teaching diversity and bringing awareness to this issue crucial for the developing preschooler. We know that after the age of nine racial and cultural attitudes tend to stay the same unless they have a life-altering experience. So the time spanning beforehand is a critical time to help children develop positive attitudes towards their own and peers’ racial and cultural identities. At Darlene’s Wee Care 4 Kids in Upper Darby, a diversity-rich classroom is a vital component to our preschool classroom. 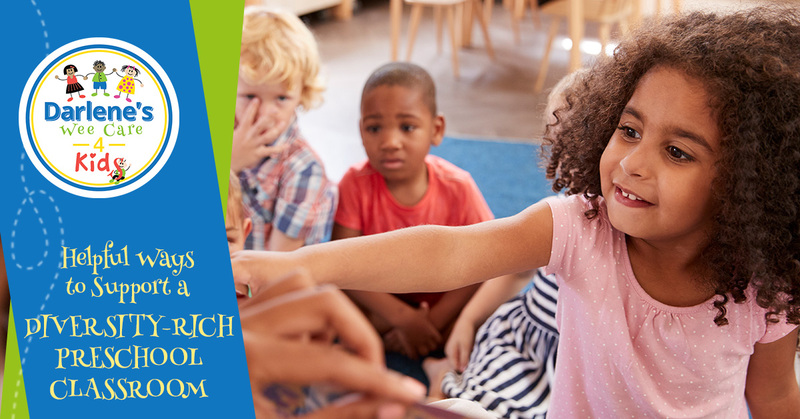 Join us in today’s post as we unpack and navigate racial and cultural issues and learn better ways to support a diversity-rich preschool classroom! The Time For Racial and Cultural Education is Now! Preschool-aged children are at the perfect time in their development to experience and learn more about their culture and the different cultures around them. Below we’ll touch on why creating positive attitudes and experiences towards diversity in early childhood is crucial for creating both citizens of the world and an inclusive culture all around. Children between the ages of 2 ½ and 3 years old begin to develop an awareness of feelings, ideas, and stereotypes about people and themselves. As preschoolers begin to interact with their world through people, the media, and their community it begins to shape their perceptions and judgments of what’s going on around them. Young children and preschoolers have the cognitive elasticity to un-do pre-shaped and pre-conditioned perceptions of others as they’re exposed to diversity and engage in meaningful cultural experiences. The three factors listed above make a diversity-rich classroom imperative because distilled, you can help shape, mold, and educate a preschooler to have positive attitudes and actions towards racial and cultural diversity. So, where do you begin to teach racial and cultural diversity in the classroom? Almost every aspect of a child’s early years including key aspects of diapering, feeding, and toilet training are influenced by cultural beliefs and values. How we talk to and interact with kids speaks to our cultural behaviors, and kids are keen to pick up on these. Kids absorb traditions, routines, cultures, languages, and racial or national identities. With this said, there are many ways to go about promoting and educating our children to thrive in an inclusive and diverse world. How can we approach a sensitivity to different races and cultures to our classrooms and provide an environment that preschoolers can thrive in? Find out below! Have a vast and diverse classroom library – Begin to build or add to your classroom library by providing books that are inclusive of all races, religions, and cultures. Diversify your crafting – Many teachers love to build bulletin boards and add decoration to their classrooms — ensure you’re creating things that represent multicultural children and reflect, in real time, the preschoolers you have. Discuss diversity openly – Preschoolers will be the first ones to identify differences, so have an open conversation with them about both similarities and differences. It’s also vital to remove any material that promotes racial and cultural stereotypes and to quickly address any racist or culturally insensitive remarks or behaviors. Explore racial and cultural diversity in your classroom in real-time. Dive in and explore with your preschoolers everything that makes them who they are — from holidays they celebrate and delicious, traditional foods, to celebrating important historical movements and things unique to who they are. Learn about a culturally responsive classroom. Oftentimes in a conventional preschool, those who are not native English speakers feel lost, overlooked, and pressured into quickly adapting to their new environment. Find activities that are inclusive and reflective of your classroom. Incorporate sayings or phrases in their native language and design a lesson around it. Teach preschoolers to be critical thinkers. Language and conversations play heavily into shaping their understanding of the world. So while you’re having circle time, reading time, or doing any activity for that matter — dialogue, talk, and converse with these tiny humans. When you ask questions and talk about things openly and honestly it helps them stay curious and pliable in their perceptions and judgments — nothing is yet solidified. The best thing as a preschool educator is to be a role model for a culturally diverse classroom by being proactive in choosing activities and books that are inclusive and representative to all your students. Diversity is important to tackle early on in preschool because, at the root of it, people are different. When we’re able to give them the tools and language skills to empathetically embrace difficult issues, it creates an inclusive environment where we all can thrive! 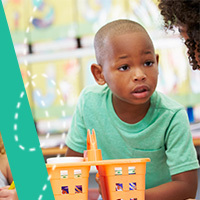 To learn more about our preschool curriculum, connect with us today!